For today's Manicure Monday we are going full-on into Spring mode! Taking a break from the recent pastels I've been sporting, I went with this new release from Urban Decay called Bang which is a saturated red-orange with a slight teal pearl finish. Absolutely love this one to pieces! Let's check it out below. I'm honestly a huge sucker for orangey-reds, corals, and tomato-red since it always looks vibrant against my yellow-undertoned skin. Bang is no exception. I know it doesn't show up in photos, but the blue pearl flash this polish gives definitely gives this shade a unique edge over my other oranges and I love that this really is a true orange but still deep enough to give a really classy look. After a base of OPI Nail Envy, Urban Decay Bang applied with full opacity in 2 coats and was finished with Seche Vite top coat. This polish applied perfectly easy and smoothly as most polishes in the orangey-reddish shade range tend to. Overall, this is definitely my favorite Urban Decay Nail Color I've tried yet! I prefer the bright shade to many of the Fall and Winter releases and couldn't ask for an easier application experience which is what I had qualms with in some of UD's other polishes. 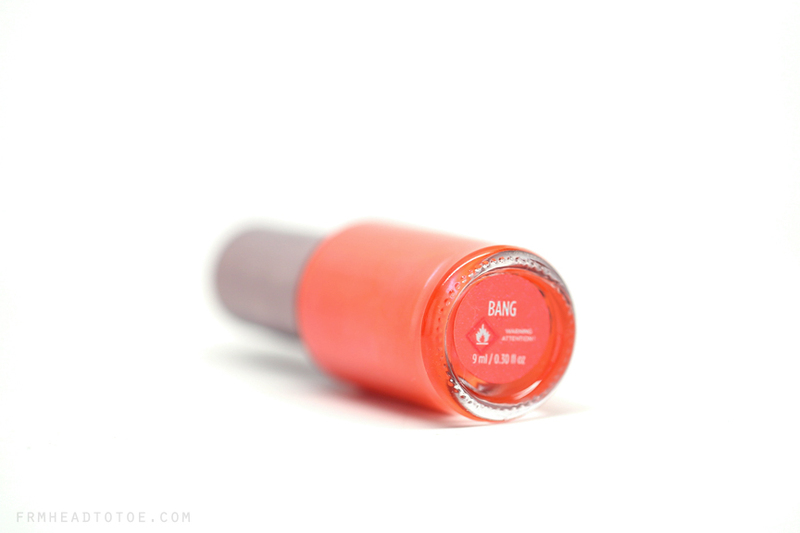 Bang is available now online for $15 at Macys and you can find previous UD Nail Color collections at Sephora, Ulta, and Beauty.com. Readers, do you like wearing orange polish? What is your favorite orange? Let me know in the comments! funny, I was in the market for an orange nail polish. My son's favorite color, when I ask him what color I should paint my nails, he always says orange. Need to get this. Absolutely love this color! I've never tried any of their polishes but these look great! It's such a great bright shade. Love it! Love this neon series you have Jen! You have beautiful nails! I prefer a more pink-orange color for myself, but this color really suits your skin tone :)! Love it <3 It's the perfect orange! pretty color!! have you ever done the dying with bong soong ah flowers? my grandma used to make me do it with her, but this reminds me of that! O X A N A M.U.A makeup blog NEW POST! TMI TAG FOR BLOG'S 1ST ANNIVERSARY! This is such a great color! I didn't know that Urban Decay had nail polish. I'll have to look out for that the next time I'm at Sephora!